We have over 30 years experience in all aspects of grinding, deburring and metal finishing. Burrs and scratches are a common and often unavoidable problem, our operators are all meticulous in their finishing techniques. Our equipment include belt sanders, bench grinders,angle grinders, orbital sanders, fuzz wheels,linishers, bead blasters and rumblers. We recently purchased a Lissmac SMD-124, because we want the best for our customers, and Lissmac leads the industry with their innovative deburring equipment. With Linishing Belt and 8 Rotary oscillating top brushes. 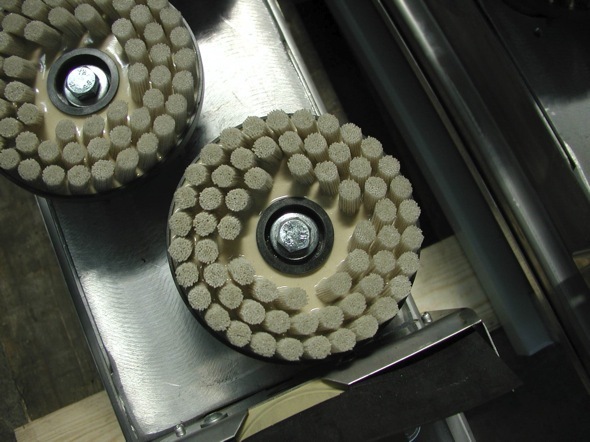 The brushes give us the option to deburr, polish, edge round, deburr upforms or slag grinding. Linishing is a process commonly used to produce a fine finish on sheet metal or plate components. 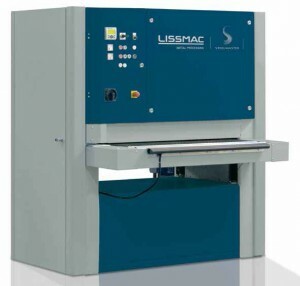 In linishing, the surface is sanded smooth using a linishing belt or abrasive pad until the lowest point of the material is found to achieve a uniform surface. 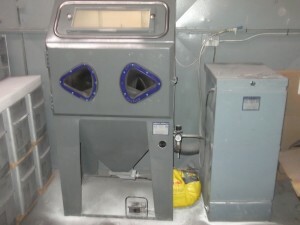 Bead blasting is a metal cleaning process that creates a clean, bright, uniform matte texture. The beads are applied to a surface using low air pressure. This process removes paint, rust and corrosion from all types of metals. 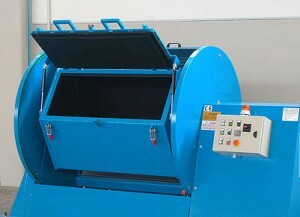 Using the bead blasting process a surface can be cleaned without any damage. The beads come in a variety of sizes. The smaller the glass beads, the smoother the surface, larger beads produce a more textured finish. Bead blasting can make a good finish better and cleaner. It also produces a better tooth for bonding. It is estimated that the surface area of metal increases as much as ten times as a result of the abrasive impact action. This increases the surface to which paint, coating or plating can adhere. Barrel finishing also known as barrel rumbling (tumbling) is a suface improving operation in which a mixrture of parts, media and compounds are placed in a barrel and rotated for the purpose of rounding corners, deburring,	grinding, descaling, deflashing, improving surface finish, burnishing, polishing and radiusing parts in bulk. Parts are tougher and stronger after rumbling. Rumbling provides a certain amount of stress relief. Forgings and castings can be blended. Machine parts and stampings can be deburred and burnished to a high finish. In addition to our state-of-the-art CNC Punching equipment, Fabricated Products offers a full set of related services including Painting, Plating and Assembly.